As the need arises to update chapter materials in print and on websites, we ask chapters to adopt and incorporate these graphic elements. Images are available in many formats. Instructions on appropriate typography and a set of complementary colors is also included. Should you need any other image formats or assistance with how to apply these graphics, please contact; NEHS@niu.edu. The emblem of the Society is a royal blue globe surrounded by a four-sided, curved corner, gold figuration. The four sides of the shield symbolize the four major areas of the English language arts—literature, writing, language, and media studies; the sides do not meet sharply at right angles, but instead flow smoothly by means of the curved lines, one into another, suggesting the creative blending of multiple forms of literacy. The circle—of perfection—the full community of readers and writers who embrace the field of English. Within the circle are an open book and a pen, traditional emblems for the language arts experience, and reminders of the potential power of words well-expressed. The royal blue background represents creativity and inspiration, while the surrounding gold symbolizes both excellence and nobility of spirit. Overall, the four-sided figure encasing the symbolic circle is supported on the base of a torch, representing the light of truth as it shines through literature, language, writing, and media. 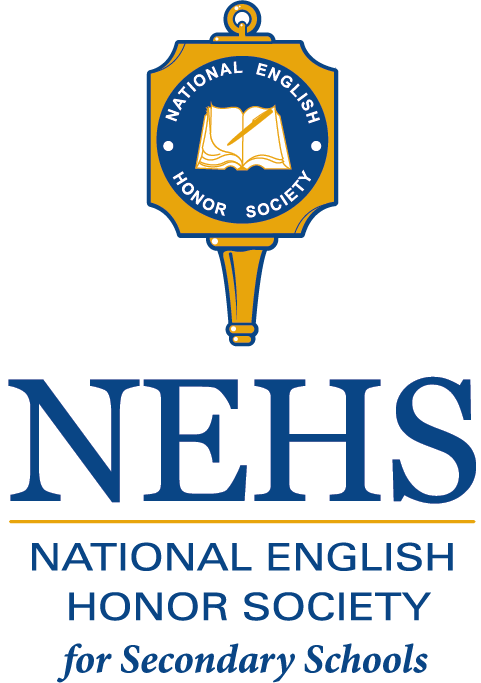 The graphic identity provides the standard placement of the NEHS emblem and the NEHS word mark. 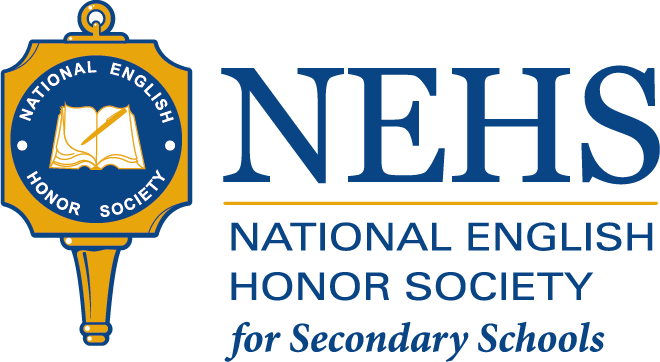 The word mark has been designed to complement the NEHS emblem so that together they present a consistent and professional image of our honor society. Horizontal and Vertical formats are also available. The alternate formats may be used in place of the graphic identity. The Primary NEHS Colors are Gold and Blue. Gold is defined by using the Pantone Matching System (PMS) Number 136 (coated). Blue is defined as PMS 301 (coated). The Secondary NEHS Colors are shown below. One or more secondary colors may be used in addition to the primary colors to add accents to a document. PMS values shown below represent use on a coated stock. The primary font is Georgia and its three faces: Regular, Italic, and Bold. If Georgia is unavailable, Times Roman may be used. If Zurich is unavailable, Arial may be used.